The Devs ARE working... be patient guys. Just a link to read through the notes for tomorrow. Guys this is A LOT of stuff. While it may not be the particular fix or thing that YOU want... it is progress and issues that need to be fixed. While there are still some things I'd like to see and changes, this is definitely a lot of good stuff. Just want to say to the dev team, thanks for the patches and fixes and to keep up the good work! We don't if it's tomorrow or even next week or the following. Unless tomorrow is now a firm date. Read the link. Update #3. Feb 12th. Tomorrow. In three days the new TOW assignment will go live, and they always drop the patch two days prior, so I would bet we get a patch tomorrow. Whether it includes all of the network and bug fixes, I dont know, but considering it saves them big $$ to consolidate.... My money is on tomorrow for a big patch. I was rolling my eyes at OP's post kissing EA/DICE's posteriors, until I finally just clicked on the patch notes. Gotta say, I'm pleasantly surprised by the fixes incoming. Well, most of them. Definitely worth a read through if you're on the fence about whether or not to click that link. Happy about the Fjell fixes. Hated going up against a team that would be up there. It would be almost impossible to get them while they rained down bullets on us. Also, the Turner fix seems to be an interesting one. I hope it's universal with all guns. Seeing your soldier load in invisible bullets/grenades was distracting as hell. 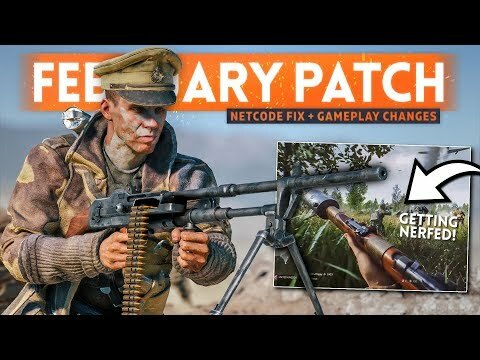 The "netcode" adjustments look promising. Anyone have a link to the patch notes thats not in pdf format? Im using the crappy ps4 browser that doesnt support pdf viewing. Tried google but just kept getting the pdf or older patch notes. Edit-scratch that just found a youtube vid that was uploaded a couple hrs ago that details the changes,here it is for anyone else interested. If the net code does not seriously change for my low stable ping and not make it feel like i'm some how playing with 150+ ping where bullets on target are not registering then its the last game i buy that is any thing to do with both dice or battlefield. its about time these game producers gave up trying to make a lag unstable +100 ping perform like a 20 ping its not going to happen. You have to admit they are working pretty hard, hats off to them. What Dice needs to do is freaking region lock their servers, boom, a big part of the problem solved. No more need for network hocus pocus to try and artificially level the playing field. I don't know if you noticed, but all it takes is a couple of 200 or 300 pingers on a 64 player server to completely degrade the server. Amen. Back in bf3/4, a lot of rented servers autokicked anyone with 100+ ping. Good times. Granted, the netcode at the time gave you a MASSIVE advantage over other players if you had between 150-200 ping. So i was originally right? There is no real date? DICE PLEASE. Nobody knows what the hell is going on with this company anymore. Yeah I'm not expecting this to fix the netcode. I hope it does. The netcode is the main reason I'm not playing. Ive never been a netcode complainer but BFV had the worst netcode I've ever seen and until it's fixed I think this game will continue to bleed players. Yeah thanks for doing your job? JK I know he works for Battlefield... and I know that it says the dates aren't final. But either this week or next. I'm banking on tomorrow. But if the netcode issue is not resolved they might bump it. This won't happen, they want people from far away regions to buy their game, but they don't want to buy any servers there. Guy in video says it's great they nerefed all these weapons while running around with a lewis laser + X3 scope lol.